Showing results for tags 'registration'. Poster on the Voter Facilitation Services, like Registration, Electoral Roll Verification, and Complaint Submissions, which are available at Common Services Centres across the country. Think Ink Sign Language Film on Voter Registration and Accessible Elections in MP4 and MOV formats. A well known fashion designer, writer and green activist from Sikkim, Omi Gurung appeals for exercising the adult franchise granted by our Constitution. [CBFC Certified] Short film with a hilarious take on deletion of names of dead relatives from electoral roll by submitting Form 7 on www.nvsp.in or by calling voter helpline number 1950. [CBFC Certified] Short video spot urging citizens to get their name deleted from electoral roll of the place of previous residence after registration at a new place. 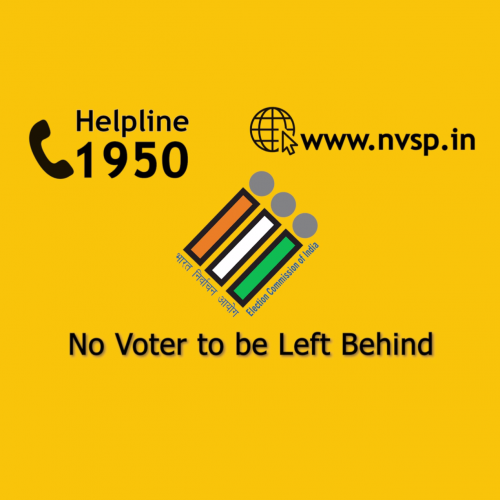 This can be done through www.nvsp.in or calling voter helpline number 1950. Short film explaining online registration process for first time voters. Footgal 2018 was a novel initiative of DEO Churachandpur under the aegis of CEO Manipur's "I am Ready" campaign. The 5 Girls each side night Futsal tournament was organised to celebrate the girl child and to garner support from electors towards Summary Revision of electoral rolls with the objective "No Voter to be Left Behind".